Originally published under the title, "Turkey: Don't Get Mad, Take Over a Bank." On February 3, Turkey's banking watchdog seized control of Bank Asya, the principal financier of the enigmatic Fethullah Gulen. "Forgive your enemies, but never forget their names," John F. Kennedy apparently once said. Turkish President Recep Tayyip Erdogan follows a different practice: He neither forgives them, nor forgets their names -- not even those of his enemies' friends. 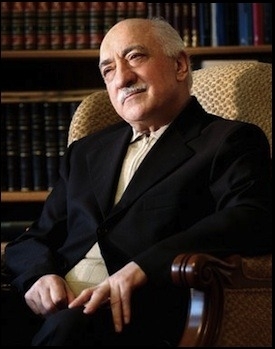 Until they openly declared war on each other at the end of 2013, Erdogan and Fethullah Gulen, an influential Muslim preacher who lives in self-exile in Pennsylvania, were the best of political allies. Everyone thought this was a "marriage made in heaven" between an ambitious Islamist politician and a preacher who, together with his millions of followers, ran a worldwide empire of schools, charity organizations, banks, media companies and businesses. Surprisingly, the ideal partnership broke up over ideological differences and a struggle over sharing power. Gulen's alleged network of senior police officers, judges and other bureaucrats were on the edge of hijacking the Turkish state from Erdogan; or so Erdogan and his men thought. The divorce was violent: Gulenists allegedly recorded and released hundreds of embarrassing audio and video files revealing a corrupt network of relationships among Erdogan, his family, four ministers, their sons and the ruling party's business cronies. Gulen was apparently hoping that Erdogan would lose the forthcoming elections (in March and August 2014). But Erdogan won both elections -- and vowed revenge. To Erdogan, this was, it appears, an existential war. Until last December, in what looked like a witch-hunt, Erdogan fought mainly by purging, reassigning or suspending thousands of police officers, prosecutors and judges who, according to intelligence agencies, were likely members of the Gulen movement. In December, Erdogan stepped up the fight. On December 14, the police detained dozens of journalists, producers, scriptwriters, police officers and former police chiefs on charges of forming an illegal organization whose members "engage in forgery and slander." A few days later, a Turkish court issued an arrest warrant for Gulen on charges of "leading a criminal organization." On Jan. 22, Erdogan geared up his offensive. In his sights were the hundreds of schools Gulenists operated in more than 140 countries, including more than a hundred charter schools in the United States. Erdogan called on foreign countries to shut down schools operated by Gulen, and proposed to replace them with state-run Turkish schools. He said the Turkish Education Ministry was working on a scheme to take over the charter schools operated by the Gulen movement. Why would Turkey's Islamist president strive to close down hundreds of schools abroad run by another Turkish Islamist? But why would an Islamist president strive to close down hundreds of schools abroad run by another Islamist figure, especially when they have the same nationality? Erdogan claimed on January 31 that the Gulenists in the country, whom he dubs a "parallel structure," have joined forces with none other than the Israeli intelligence service: "The sincere [devoutly Muslim] people backing this parallel structure [the Gulenists] should see with whom this structure is cooperating... Shame on them if they still cannot see that this structure is cooperating with the Mossad." Erdogan was bold, but not creative enough. It is the half-century-long tactic among the world's Islamists to accuse an enemy or a rival of cooperating with the Mossad -- supposedly the most evil organization in the world. Unsurprisingly, the Turkish president did not offer any evidence for any kind of link between the Gulen movement and the Mossad. Apparently, the accusation's only aim was to position public diplomacy for Erdogan's next salvos. On February 2, Turkey's state-run news agency, Anatolia, said that the government had cancelled Gulen's Turkish passport. Turkey informed U.S. officials on January 28 that it was revoking Gulen's passport because it was issued based on a "false statement." It was no secret that this was a carefully-planned legal move to force U.S. officials to extradite or deport Gulen. In a televised interview on January 29, Erdogan actually said it would be appropriate if the U.S. deported Gulen. The way Erdogan fights Gulen is a message to present and potential enemies: if you dare to gain my enmity, this is what you, too, will face. But Erdogan's biggest blow ever came on February 3, when Turkey's banking watchdog, BDDK in its Turkish acronym, decided to take over 63% of Bank Asya, Turkey's biggest Islamic lender and allegedly the principal financier of Gulenist activity in Turkey. BDDK said it transferred 63% of Bank Asya's shares to a government-controlled fund and appointed a new board of directors. It said it took over the shares of the bank because "it violated banking laws regarding transparency of partnership structure and organizational scheme." This should come as no surprise. Last year, BDDK placed Bank Asya under watch, probably trying, since then, to find the best legal pretext to destroy the treasure room of President Erdogan's biggest enemy. The fall of Bank Asya will not be the end of the war. It only signals further offensives by Erdogan on other Gulen targets, small and big. Erdogan is raising the stakes, not just to hit Gulen. The way he fights Gulen has a message to present and potential enemies: if you dare to gain my enmity, this is what you, too, will face.